Lifeline Vascular Care is dedicated to delivering quality vascular care to patients with a variety of chronic conditions, including those with End-Stage Renal Disease (ESRD) and Peripheral Arterial Disease (PAD). Lifeline Vascular Care is the nation's largest network of freestanding vascular centers focused on caring for the needs of kidney patients. 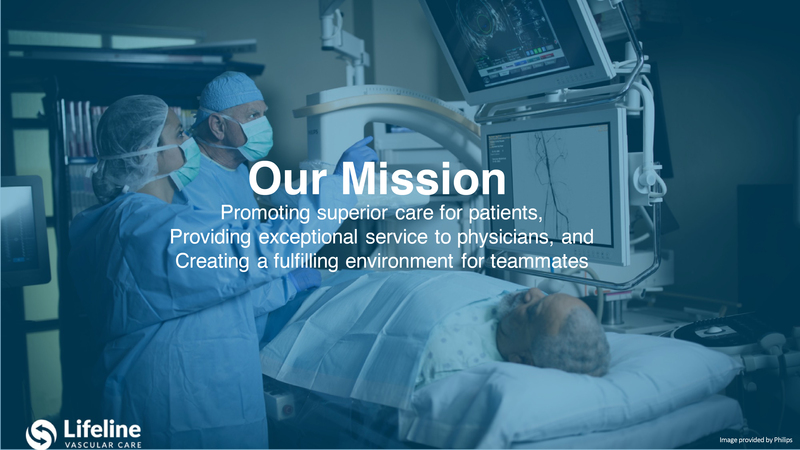 Our mission is to promote superior care for patients, provide exceptional service to physicians and create a fulfilling environment for teammates. When it comes to vascular access, we believe that timely and appropriate interventional care is the key to a healthy and functioning vascular access. After all, a healthy access with good blood flow allows patients to receive the best dialysis possible. With over 1.2 million patient encounters and an overall procedure success rate of 98%, we know that a patient’s access is their lifeline. A growing number of our outpatient centers offer procedures targeted at the diagnosis and treatment of Peripheral Arterial Disease (PAD). While many Americans show no symptoms for this silent disease, up to 120,000 limbs are amputated every year due to poor blood circulation. Every day, patients are arriving at our centers with leg pain caused by PAD to receive treatment to ease their symptoms. We invite you to join us in the fight to save limbs and lives! We invite you to visit our website at https://lifelinevascular.com to learn more about how we are continuing to improve the delivery and outcomes of interventional vascular care to patients throughout the DaVita Village, and beyond!